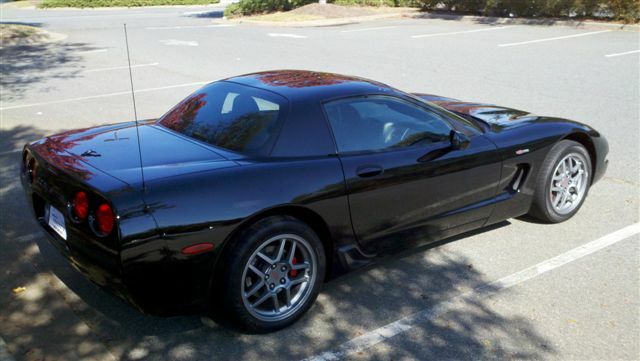 Hi all .... just bought myself a "new" Z06 for my 60th birthday. I am at the bottom of the learning curve but having a blast. It had 4275 miles on it when I bought it a month ago. Now it has nearly 6800. As you can see, it's garage queen days are over and it now has to work for a living carrying me to work everyday. Here it is on it's first day "on the job". Congrats on the new vette and the 60th bday. Very nice present!! Enjoy. Welcome to and congrats on your 60th and C5 Z06. Wow, you really found a garage queen. What year is it? Congrats on your Z and happy birthday. It's great to see another "local" Charlotte member. Thanks all .... nice to be here. Congrats on the Z and welcome aboard. Welcome to and Congrats on the new Z!!! Welcome Aboard! Congrats on your "new" Z06! With that low of mileage, it must have been a garage queen. But what the hey, the last owner saved her just for you!